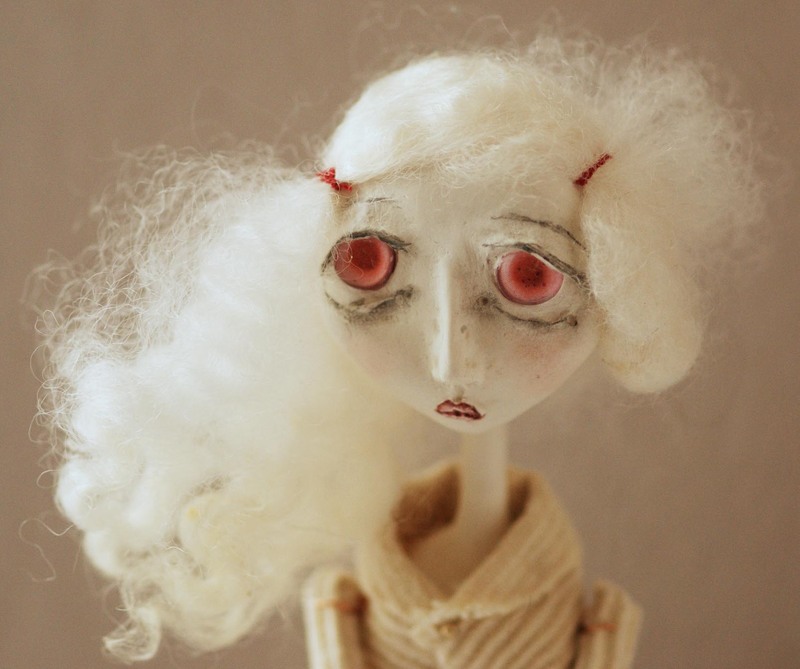 My name is Sarah Faber but Black-Eyed Suzie is my doll-making alter ego. 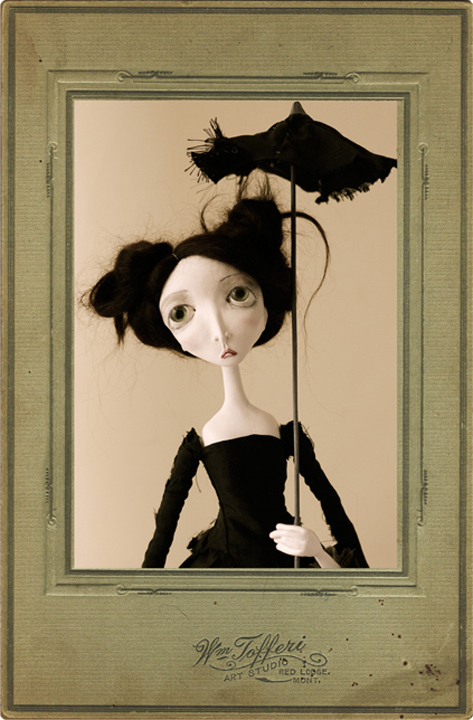 I make somewhat creepy and somewhat pretty art dolls inspired by Victoriana, the Jazz Age and a mish-mashy, post-punk aesthetic. I’m a fiction writer, so I try give my dolls little stories, tragic histories, eccentricities, bad habits and a few bon mots. I’m working on two doll series; one inspired by Alice and Wonderland and the other inspired by my favourite chicks with mics (e.g. Neko Case, Billie Holiday, Agent Ribbons, The BeGoodTanyas). I’m also close to finishing a draft of my first novel. Literature. I love Gothic novels, and have studied a lot of Victorian fiction and poetry. I love anything by any Brontë, Dracula, Poe, Hawthorne, Henry James. 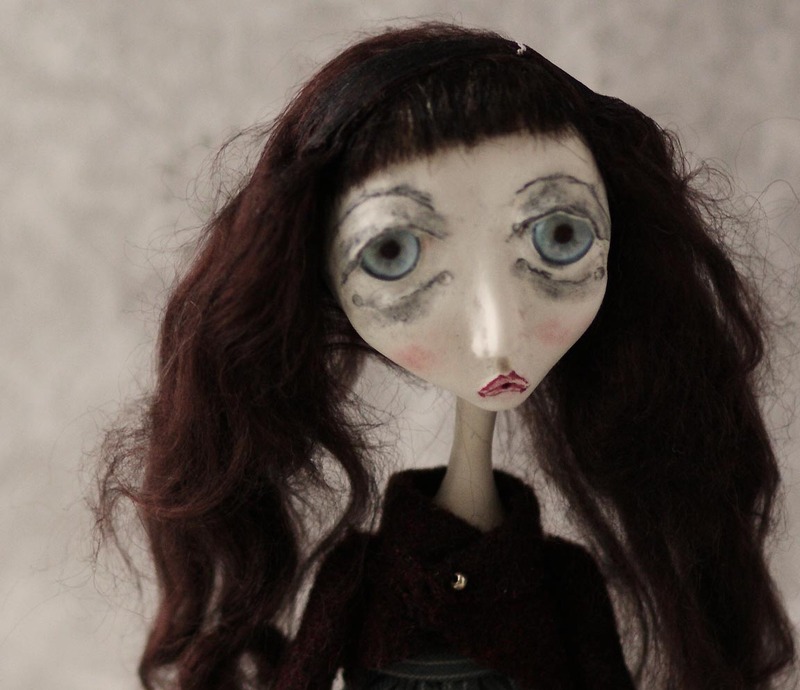 Consumptives, fallen women, pissed-off women, melancholy urchins, spooky governess’, match-girls – these are all characters from books that I imagine as dolls. I also love Modernist fiction and have recently started making dolls inspire by the 20s & 30s. I don’t think I’m well-known enough to be misconceived, but people do sometimes think all dolls are cute or banal in the way that commercial dolls can be, when in fact there are a lot people making strange and interesting dolls. Also, some people think that I must wear corsets and bloomers and all sorts of fabulous clothes based on how I dress my dolls, when the sad truth is I live in jeans and Converse shell tops because I really like being comfortable. I think they are actually one and the same in this case; dolls are not really taken that seriously so on the one hand, I feel no pressure to be a ‘serious artist’ – I can be silly and earnest at the same time. But sometimes when I tell people I make dolls, they assume I’m must make frilly little confections that wear grotesque smiles and hold teddy bears. Technology has allowed to me to quit a series of dreaded day jobs and start my own online business selling dolls. I don’t think the things I make have a broad enough appeal to do well in brick & mortar stores or on the craft fair circuit, so I feel very lucky to be able to sell online and find other freaks and geeks who like dolls. Oh dear – am I wise or together enough to give advice? I don’t think so. But I’ll say this, though it will probably sound a) obvious b) corny c) seriously earnest: I think people should do what they genuinely love and not worry about being commercially appealing. Unless they want to make some serious coin. In that case, I can’t help. I lurv Coco Rosie. And ‘Your Diamond Heart’ by Marisa Nadler, which literally gave me chills when I saw her perform it live. Dolls are creepy, but creepy can be beautiful! I have been looking for your contact info all over, I hope this one finds you. I would like to write a feature story on you and your creative Goth dolls. I am a contributing writer to Doll Collector Magazine, and have been for many years. My proposal has been accepted by the magazine so If you would be interested in being published there, please get a hold of me at this email address chanelasia@hotmail.com Thank you, looking forward to hearing from you soon.